Baum Squad: The Baum Family Blog: 7 Months Old: the Stats! 7 Months Old: the Stats! Lordy, it has been a busy few weeks. I wanted to get Lilly's 7-month stats down before I get too lazy busy, and these are always long so here goes. As 5:30 is ENTIRELY too early for bed time and I don't feel like waking up at 4 am tomorrow, I let her rest on my chest (and cherished every second - doesn't happen often!) for about 20 minutes before waking her tooshie up to eat and get a bath. Sheesh! Feeding: We are still primarily nursing, but Lilly is starting to eat more and more solid food. Lilly's doctor told us at her 6-month appointment that L would let us know when she was ready to move to three "meals" of solids per day, and I think we are quickly approaching that time. Right now, she still gets fruit (normally two) with oatmeal in the morning and vegetables (again, normally two) with rice cereal. She normally eats four cubes in a sitting (fatty!). I've started googling fun recipes to introduce meat, but so far she hasn't tried any yet. We've tried several new fruits and veggies, though, since the last "update" post. Lilly still prefers sweet foods over anything else. She still does not love anything green, but I think I've figured out that it's more of a texture aversion than a taste aversion. I've been making her baby food, and for whatever reason the green stuff just normally doesn't puree as smoothly as the other food - broccoli, for example, when pureed is smooth but more grainy than, say, a sweet potato. The reason I think it's texture that she's opposed to is because when we traveled over the weekend, I bought food instead of dealing with flying with it, and she ate the green vegetables that I purchased without incident (unlike at home, when on a good day I can sing songs and act crazy to distract her and in the mean time trick her into eating the green stuff). They were mixed with some different foods, so maybe I will try that the next time I make batches of baby food as well. The new foods Lilly has tried since the last post are: broccoli, green beans, blueberries, mango (she LOVES them), edamame. I felt like there were more, but if so I can't remember off the top of my head. In regards to nursing, the time between feedings is starting to vary a little - she is going for longer stretches between feedings. 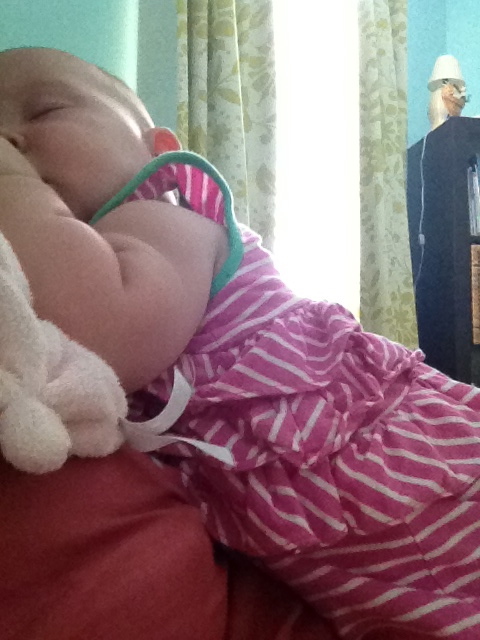 She nurses when she wakes up (between 7-8 am usually), and I normally feed her solids within an hour of her nursing. She hasn't been nursing again after that first feeding until well after her first nap, so sometime between 12-1 (prior to the past few weeks, she'd been nursing every 3 hours on the dot, so this is a big change). After that first stretch, she normally nurses again after every 3-4 hours until the next solid feeding sometime before bed. Firsts This Month: Lots of these. Lilly attended her first wedding (Aunt Katy and Uncle Josh's!) ex utero shortly after the last monthly update (did I write about that in the last post? It was so close, I can't remember). 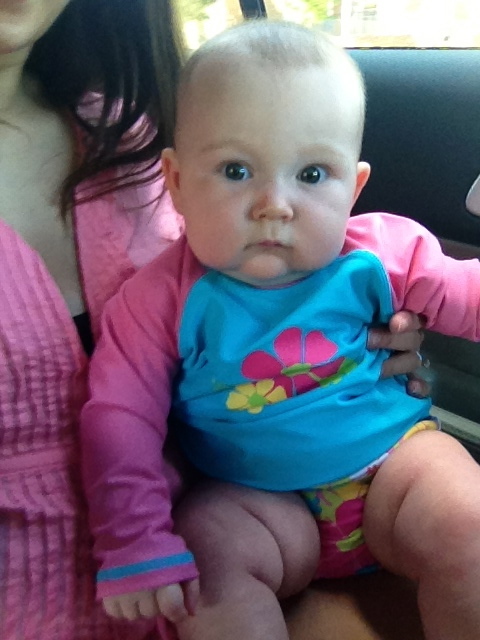 She also had her first trip to the mountains and her first swim lesson (with her bestie, Hadley!). 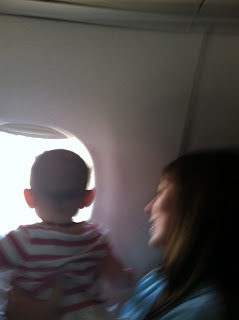 Her first plane ride occurred over the weekend. Quick plane ride update for those of you who have been asking: she was amazing, both on the plane and throughout the weekend. Both on the flight to Chicago as well as the return flight, she was happy and giggly and very intrigued by all of her surroundings (so nosey!). She also napped for about half of both flights, which was a huge bonus. We had flight attendants and fellow passengers on both flights tell us how wonderful she was, that they normally worry when they see a small child but that she was awesome (we think so, too!). If the pressure in her ears during takeoff/landing bothered her at all, she didn't let on. To try to combat it on all of our flights, she nursed some, sucked her thumb some, and also I made her a bottle with water and just a splash of apple juice (since she doesn't love the taste of water by itself), and I guess something out of all of that did the trick. One funny: remember how I bought her new toys to keep her entertained? Yeah, didn't need to spend the money because the child was enthralled with the seat-back tray tables (is that what they're called? the trays that fold down on the back of the seat in front of you?). Seriously, they weren't even folded down and she was for whatever reason obsessed with them. She kept touching them and giggling. It was hilarious. 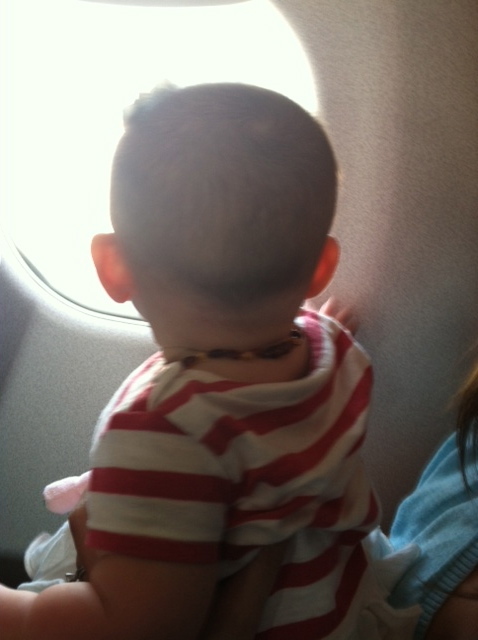 She also enjoyed looking out the window. Still no sign of the first tooth! 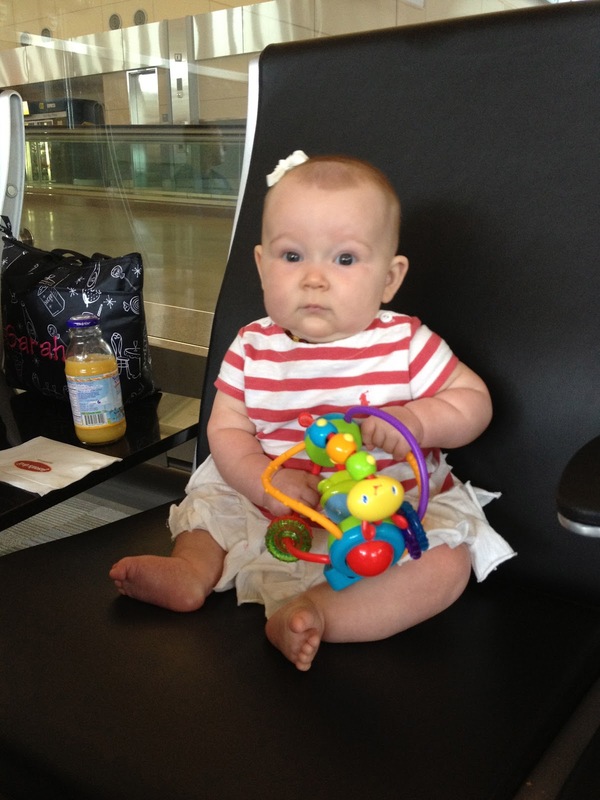 Friday morning waiting to board the plane, after eating solids Mommy took to the airport. Hamming it up and flirting with our fellow passengers - and playing with her new toy! Being silly with Daddy prior to boarding. 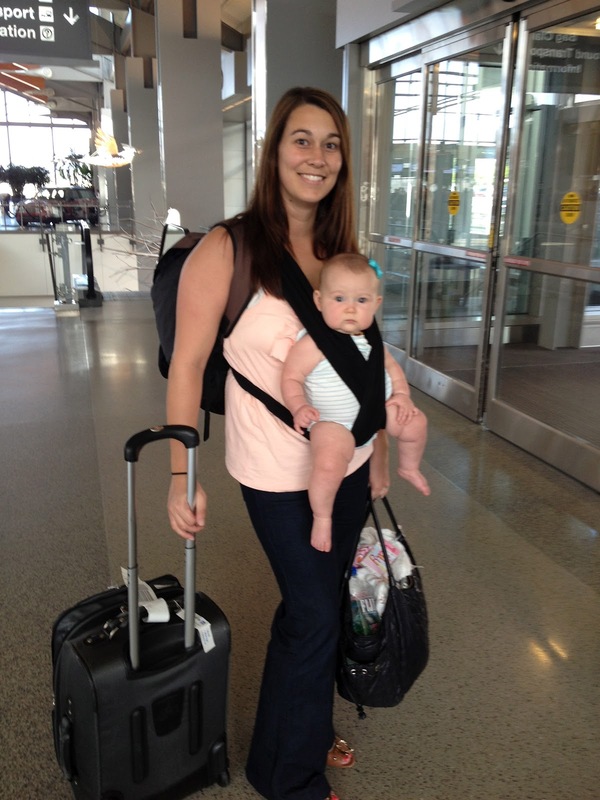 Airport travel: baby strapped in front in the k'tan, GoCrib strapped to the back, diaper bag in one hand pulling the suitcase with the other (Dan had the cooler with breast milk, the other suitcase, and the car seat in the handy dandy car seat carrier strapped to his back). Looking out the window, ready for takeoff! Let's get this show on the road, people. Developments: About a week after my last post, Lilly started sitting up on her own like a champ. I'm not sure whether ab muscles can develop that quickly or whether it was just a matter of her being nosey and figuring out that she can see a lot more, but she's been sitting up on her own ever since and loves to play that way. She has started doing this scooting thing, but only when she's laying on her tummy and she only goes backwards. She still pushes up but no signs of crawling just yet. She also just today started pulling herself up to a standing position. Luckily, she hasn't yet figured out that she can use objects to do this - she only does it when I hold out my fingers. She also likes to be "standing up" (with help) and looking around. Lilly is getting more and more vocal, and has been mimicking the sounds we make for a while now but has been doing it even more so as of late. Her favorite sounds to make are giggles and laughs, squeals, mama, dada, lala, baba (pronounced like it rhymes with mama), and this terrible squawking sound that we have taken to calling the "baby pterodactyl noise." Note: I don't think she associates me with mama or Dan with dada yet, but she loves to say both. Likes: I don't think there have been many changes since last month's post. She still loves being outside , eating and swimming more than just about anything else. Layla. Bath time. Snuggling. Giggling. Talking/cooing. Reading books. Nap time/sleeping in general. Sucking her thumb (especially when sleepy). Music - she LOVES to sing songs, the sillier the better (Daddy's specialty). Laughing. Rolling around and scooting. Being naked. Being silly with Daddy. She still loves the jumperoo and door jumper. She also LOVES trips to the grocery store. And the airport - I had her in the baby k'tan with the GoCrib strapped to my back and pulling a suitcase for our travel over the weekend (see photo above), and she squealed, giggled and squawked her way through the airports. She loves to people watch! Dislikes: Again, the green veggies and rice cereal/oatmeal (when not hidden in fruits/veggies) are not her favorite. Also, contrary to what I said last month, she still hates cold water - total meltdown and refusal to participate in the last swim lesson. I guess it just depends on the degree of cold because we've taken her swimming quite a few times when the water was cold in our neighborhood pool and she's been okay. Maybe because it's outside and there's more to distract her from the temperature? I got her a swim shirt which seemed to help when we took her swimming yesterday and the water was cold, but the Y pool is cold on a whole new level so we'll see how it goes on Wednesday. She's still decidedly not a fan of boredom or being ignored when she wants something. What I'm Thankful For: I know I say it all of the time, but after this weekend more than ever I am thankful for a good baby. She is so flexible, which in turn has taught me to go with the flow and not get all bent out of shape if every little thing doesn't go exactly like I planned it in my head. I am not trying to brag, I am just so proud of how well she did over the weekend given the circumstances - she did so much better than I ever even hoped. Love that little chunk monster! What I'm Looking Forward To: Mommy and Daddy's first vacation sans baby for Sheila's wedding weekend in California! This one is a little bittersweet, because I am excited to spend some time away with Dan but at the same time I'm dreading leaving Lilly. I know it will be good for all of us and that she will be in great hands with Grandmommy and PawPaw, and I'm so looking forward to celebrating with Sheila and Casey on their big day, but it's always hard to leave Lilly. Also spending this upcoming weekend at home for once! We've been on the go lately and I am utterly exhausted. Oh, and Appalachian State and Panthers football. Next Pediatrician Appointment: Not until 9 months old, so sometime around October 24. How Mommy's Doing: I'm going to take this one off, because it always turns into "I am fat and I hate it." Ha! Oy, this one was even longer than normal posts, but I wanted to make sure to get everything in since this is Lilly's baby book! Hope everyone had a wonderful weekend and that your week is off to a great start.